Get nothing but the best. A set of window shutters from Son-Ray Blinds can add elegance and sophistication to any room. We pride ourselves on only stocking and installing the best, most luxurious blinds for our Sydney clientele. Effective and gorgeous, our shutters will cut excess light and heat, leaving you with a cool, comfortable room that glitters with style. 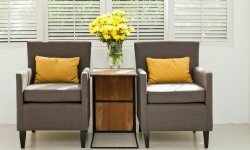 In addition to blocking out light, wooden window shutters offer excellent acoustic and thermal insulation for your home. They offer a unique combination of traditional or modern appearance depending on the decor they are surrounded with. The shutters come in a variety of wood grained stains or solid colours to suit the existing decor of your home. Whether you’re looking for a modern, contemporary look or are interested in a more rustic or classical tone of wood, we can satisfy. Each room is different and each customer has a different vision for their home, and our team always strives to deliver on that vision. All work done by our technicians is made-to-measure for the exact installation area – we always strive for precision to ensure that your shutters hang perfectly. 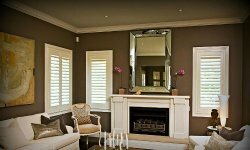 For blinds, shutters and window coverings in the Camden, South West, Greater West and surrounds areas contact the local specialists. Deluxe Son-Ray Blinds have been operating out of Narellan for more than 20 years and understand the demands and preferences of our neighbours. With a full range of products, we have something for every home. Don’t shop with the amateurs. A phone call to our team promises you smart, sophisticated appointments for your home. Call us at our Narellan location today on 1800 766 744 and find out what we can do for you! Using a vacuum with a brush head will remove larger dust particles from the shutter surface. Open fully and wiping with a cleaning cloth will remove more fine dust particles. Constructed from a tough poly-resin material, our Thermopoly shutters are ideal for bathrooms, kitchens and laundries due to their high moisture resistance and easy cleaning. Their slim, smooth and refined finish make them a popular choice in both modern and provincial style bathrooms. Their durability is second to none and because our thermopoly is hypo-allergenic, it’s ideal for young families and elderly folks with health concerns. 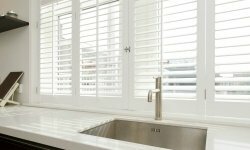 If you’re looking for hardwood shutters that effectively block out light, come in a wide range of wood grained stains to suit your home and can be measured to fit any area, including circular or arched then you can’t look past our Basswood Timber Plantation Shutters. They also offer excellent acoustic insulation, making them the perfect addition to houses in highly congested areas. For security and protection that is subtle in its design, you can’t pass up our aluminium-stainless steel shutters that shut straight and lock securely. They’re also the perfect barrier to Australia’s harsh heat, wind and rain conditions, creating an ideal living space all year round for your family. All you have to do is choose between hinged, sliding or multi-fold. Protect your home and family from wild weather and potential break-ins and save on energy costs with our thermal insulation roller shutters. These high-grade shutters are also guaranteed to reduce noise transition by up to 50 percent, making them ideal for shift workers or young families who struggle with getting sufficient sleep. © 2019 Son Ray Blinds. All Rights Reserved.